Tracy Pointer is a native of Louisville, Kentucky. She grew up in Detroit, Michigan, moved to Nashville to attend TSU in 1988. She then obtained her Bachelor of Science degree in Speech Communications from Tennessee State University 1993 and later pursued additional higher education goals and received a Master of Arts degree from Trevecca Nazarene University in May 1998. Currently employed at UPS, Tracy has been with the organization for 20 years. Her career at UPS began while she was a student at TSU and worked part-time. It evolved into full-time managerial positions upon graduating from TSU. The majority of her career has been in divisions in Human Resources (for over 16 years) in various capacities: Internal Communications, Workforce Planning, Office Management, Community Relations, Congressional Awareness, Learning & Development and HR Administration. She also spent one year in Hub Operations and six months in Business Development. Tracy is currently an Area Human Resources Manager for the Mid South District of UPS. She has served the community through participation in Young Leaders Council, Top Stars, and United Way of Middle Tennessee Volunteer Review Team (VRT). Tracy has served on non-profit boards for Girl Scouts of Cumberland Valley Board, League for Deaf and Hard of Hearing, and Chattanooga Urban League. 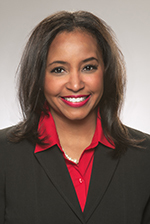 She is currently on the Advisory Board for the United Way of Middle Tennessee RH Boyd Leadership Society, a Board Member of the Urban League of Middle Tennessee and the Miss Black Tennessee Pageant and Advisory Board for Leadership TSU. As a member of Lake Providence Missionary Baptist Church, she has served as a coordinator for the One Accord Dance and Drama ministry – delivering dance interpretations through sign language. In April 2007, Tracy founded GROW – Golfers Recognizing Opportunities for Women, Inc. The mission of GROW is to train and provide personal and professional development opportunities for women through a mutual interest in the game of golf. She has plans to expand the efforts of GROW to areas outside of Middle Tennessee and the state of Tennessee, as well as implementing a component of GROW for young girls and golfers at the collegiate level. She has been named as a Top 40 Under Forty Business Leader by Nashville Business Journal and has also been named as One of Nashville’s 25 Most Beautiful People by Nashville Lifestyles Magazine. In 2005, Tracy and her identical twin sister were winners of a casting call for Wrigley’s Doublemint products. Tracy is a proud member of Alpha Kappa Alpha Sorority, Kappa Lambda Omega Chapter. She is a former Mrs. Tennessee International and Miss Black Tennessee. Tracy is married to Patrick. They have two beautiful and energetic children. This is the right sidebar. Replace this content with your own.